Some months ago I had a liminal moment as a Star Trek fan. As my co-worker and I were bullshitting about Star Trek, he asked me to define the United Federation of Planets as a political entity. I responded as any good Trek fan would: the Federation is a federal state of semi-autonomous worlds, all of whom agree to abide by the Federation Charter in terms of local domestic policy and adhere to the Federation Council in terms of collective foreign policy. It is a benign, egalitarian, and socially responsible state. My co-worker smiled as I walked into his trap. As an alternative interpretation, he suggested that the Federation is a jack booted dictatorship akin to North Korea. 100% employment via the state. State controlled access to food and water. A deep culture of surveillance aboard Starfleet vessels despite civilian populations therein. No civilian oversight over Starfleet. No free exchange of political discourse. No mention of elections within the Federation. Starfleet as both standing military and civil police. No observable contemporary popular or artistic culture. For this post, I want to focus on the last point in the list. The utter lack of a vibrant and contemporary culture in Star Trek suggests there is something odd and repressive about the Federation. At the very least, it evokes images of what Glaucon called a “City of Pigs,” in Plato’s Republic. The City of Pigs being a place that is peaceful, cooperative, and well ordered, but utterly subject to the utility of its self-sufficiency. To my research and recollection, Star Trek in all its incarnations, has given us maybe two examples of a contemporary popular/artistic culture. Let us take each series in turn and highlight the good, the bad, and the possibly authoritarian. NB: Spare me any comments about references to the 20th century being designed to make the series more accessible to the audience. I’m not painfully oblivious that way. The point of this exercise is to demonstrate how that genuflect to access creates a cultural void that is indicative of the Federation as an artistically repressed state. The Original Series didn’t spend much time dealing with the Enterprise’s crew as people with interests beyond their work. Likewise, we didn’t get much in the way of specifics about the Federation as a place. Whenever the Federation was discussed, it was almost always in comparison to the Soviet-inspired Klingon Empire. TOS was about exploring the future through the lens of the frontier. When it did give us a glimpse into the off-duty hours of the crew, what we saw was wholly rooted in past. The season one episode The Conscience of the King demonstrates the seeming height of entertainment as a troupe of players staging a show of Hamlet. Off duty, the crew occupy themselves with Chess, card games played with conventional decks, or judo. Books are often mentioned as a constituent part of the library computer, but nobody is ever seen to be reading for pleasure, unless it is with preternatural speed as to identify said character as an Other. Physical books are rarely seen. One of these rare examples of books on camera is the office of Samuel T. Cogley, who himself is perceived as a radical throwback for refusing to get with the times and embrace e-publishing. It should be noted that Cogley’s books were legal in nature. TOS shows us almost nothing of the twenty-third century that isn’t rooted in the twentieth century. Again, I know that’s due to the series being an allegory for the Cold War and a vision of an optimistic future built around collaboration and cooperation. That said, a truly open societies is in part defined by a thriving artistic community that engages with the issues of the day. TOS’ contemporary culture, as depicted on screen, is bereft of that artistic discourse. Perhaps in spite of Gene Roddenberry, TNG set more stories inside the Federation, which itself became a more tangible thing. The Federation was no longer a future analogue of the Western powers of the 20th century; it was a beacon for liberalism and democracy in the wake of normalized relations between America Earth and the Russian Federation Klingon Empire. It was a high water mark for civilization. Yet at no point is it presented as a society that puts any premium on artistic expression or maintaining a contemporary culture. Despite presenting life within the Federation as idyllic, its culture, as seen through the Enterprise, continues to be defined by centuries old Earth history. The most popular holodeck programs are period detective stories e.g. Sherlock Holmes and Dixon Hill. Less popular holodeck programs feature the works of Shakespeare and Charles Dickens. Holodeck programs featuring aliens – not withstanding Worf’s workout program – are non-existent. Musical concerts aboard the Enterprise focus exclusively on Classical music with the odd nod toward Riker’s fixation on early 20th century Jazz or Picard’s ancient flute music. Television, radio, and film are abolished and replaced with nothing. Moreover, art in TNG is either abstract chotchkies – e.g. 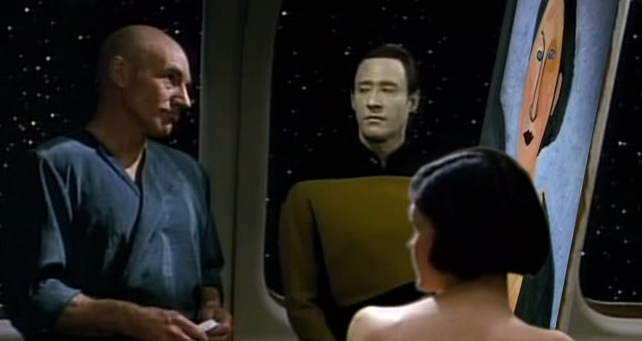 the glass thing that Data’s girlfriend got him in In Theory – rooted in history – e.g. Worf’s painting of the Battle of Garosh (sp?) in Parallels or Picard’s Kurlan naiskos (The Chase) – or decorative portraiture (as seen above). The Western world moved away from the notion of art as something propped up by a monolithic view of history and/or religion in the 19th century. The hand and voice of the artist became the focus of art in the 20th century. Yet this trend seems utterly absent in the 24th century. Data’s paintings are always missing a dialogue beyond showing his attempt to be human through art. There isn’t even evidence of holodeck programs that explore the history of the Federation through a subversive or revisionist lens. Surely someone had an opinion on the Third World War that wasn’t in-line with the official history books. The holodeck seems like the perfect mechanism for dissenting from the main stream, or offering a commentary on life as it is. Alas, these things are never seen in TNG. In fact, the series goes so far as to frame the near-history of Earth and the Federation as something to be wholly eschewed. We wouldn’t even know about the post-atomic horror of World War Three were it not for Q taking the Enterprise crew out of the 24th century and placing them into the 21st for humanity’s trial. Now, gentle reader, rather than imposing upon attention spans with a post that would likely run in the neighbourhood of 2,000 words, I’m going to offer up a rare “to be continued.” We will pick this up again on Thursday with a look at DS9, Voyager, and Enterprise.